Sometimes there are no words…no words of inspiration, no words of provocation, no words of illumination. But there are icons, images, visual impressions all round in the world. When I have wearied of words, on which I am inordinately dependent, and they fail me, I open my eyes to the Light carried in images and in people. This summer I seem to have had enough words–political words, ecclesiastical words, even words that are too clever by half. I am even tired of my own words, or attempts at them. But I long to sense the Light of Grace, and I remember how often Grace is articulated in exemplars in my life, people and things in whose presence I can recognize and rest peacefully in Grace and Truth. There was a grandmother, small and unprepossessing, from the South, whose gentle manner and powerful faith commanded confidence and trust from any who sat with her near her corner chair. There is a spiritual director who appears to be made of fairy dust, living in a well-used library of text and symbol, with a black cat and a welcoming smile. There is an author of books who moves with quiet and ease, and when he speaks with confidence, a hush falls on the room. There is an anthem by a composer who recently left this world; each chord of this song sung by a choir intimates holy presence. There is a shoreline, away from a larger body of water, where the small wavelets lap in peace along the sand and rocks. Each of these icons brings me into peace, and reminds me that there is peace to be had. Wendell Berry has reminded me of “the peace of wild things, who bear no forethought of grief,” and when all the words bring no peace, I look to these images–people, places and things–who assure me that peace is still waiting to surround me. 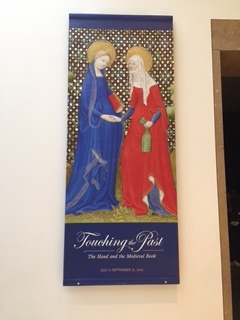 In an exhibit of illustrated manuscripts at the Getty Museum this week, I found yet another icon in the central offering, from a 15th Century French prayerbook, the centerpiece of the exhibit, an illustration of the greeting of Elizabeth to her cousin Mary in the gospel of Luke. I spent 17 months marinating in this story when I first retired, and I came to know Elizabeth as that icon of peace for a young woman whose world was turned upside down by the appearance of an angel. All the gentle manifestations of hospitality are evident in her–her joy, her faith, her warmth, her hope, and that safe place in which Mary could begin the spiritual practice of pondering–paying attention to what was happening in her body, her mind and spirit–in safety and in rest. In a restless and chaotic world, in the absence of reassuring rhetoric and thoughtfulness of loud pronouncements, in the numbing reiteration of talking points and faux narratives, I look for those people and things that embody peace. Not the least of these invitations is to looki again at Jesus…a peaceful presence always. Lady Julian tells us that, “He is our peace, when we ourselves are in un-peace.” My eyes and heart can rest with him. Thank you Elizabeth. Leaves a lingering presence of peace in its gentle wake. I am glad to find your site again. Thank you for being you.